Vision Company specialists have managed to prove that bracelets nowadays are not merely fashionable and expensive addition for a dazzling image, but also a unique accessory that is able to restore our health. Initially, thousands of years ago, bracelets possessed mystical meaning. They were thought to protect from evil spirits, enemies, misfortunes and illnesses. Historical and archaeological sources consider bracelets an essential part of both male and female image. Many ancient peoples wore bracelets: Sumerians, Incas, Egyptians, Romans, Scythians, Greeks and others. However development of civilization lead to the gradual loss of mystical and symbolic essence of these ornaments. They remained as purely decorative elements. Thus most modern bracelets have become plain showcases of designer and jeweler skills. The Vision Company has decided to recover the main purpose of the bracelet that it initially acquired—preservation, protection and strengthening of health. You might wonder, how this could be possible. Plain and simple—it has nothing to do with magic. Innovative technologies and latest medical innovations have allowed to unite the power of ions, magnetic and infrared rays for the benefit of health. This made it possible to create a truly unique accessory—PentActiv bracelet with bioceramic inserts. Thanks to nanotechnologies PentActivbracelets unite the power of five elements: silver ions, oxygen ions, infrared rays, germanium electrons and magnetic waves. 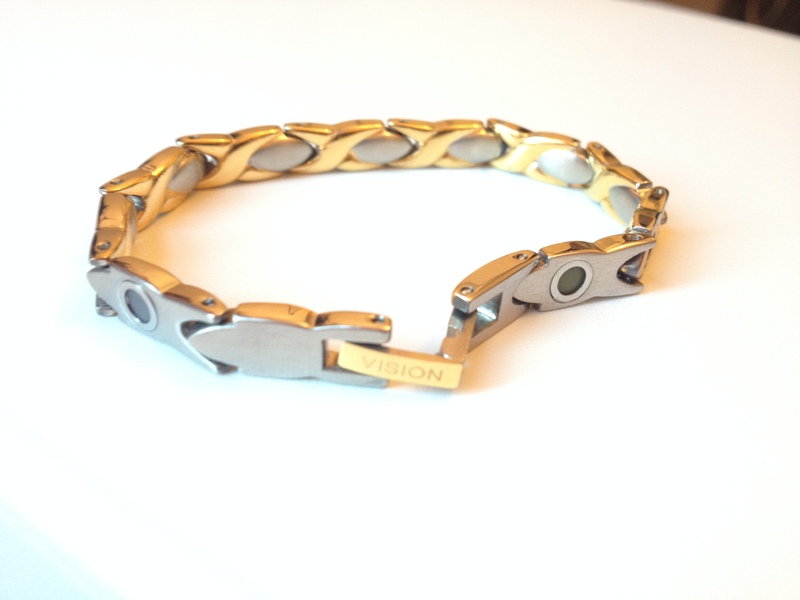 Manufacturers of similar bracelets usually confine to using merely three or four types of active inserts. However specialists of the Vision Company have decided to enhance the effect of the bracelets and created PentActivbracelet with five elements. Vision is the only company at the current market, which produces bracelets precisely with five elements. This unique combination of active elements enables every person to improve their health and general well-being. Most of us could hardly imagine that rays and ions may actually possess a beneficial impact on our health. However scientists have proved that the smaller the size of an active particle is, the more it influences the body. Hundreds of years ago legends were told about the unique qualities of silver. And in fact, all myths were confirmed with time. Silver is not just precious metal, it is an active microelement that is indeed able to benefit our body. This metal takes part in the synthesis of ferments, vitamins and hormones, has a stimulating effect on hematopoietic organs and protects the human body from pathogenic bacteria and viruses. The smallest particles of silver—approximately 3-5 nanometres—are its most active elements. Precisely these particles are contained in PentActiv bracelet. You may have noticed how fresh the air can be after a violent storm, and how pleasant and easy it is to breathe in the mountains, on the coast or in the countryside. The healing power of such air is conditioned by the ultimate concentration of negatively charged ions of oxygen—anions. Negatively charged ions stimulate metabolism, boost the immune system, regulate and stimulate physiological functions of the body. According to survey results, anions decelerate development of over 30 diseases, or else alleviate their symptoms and serve as auxiliary treatment. AeroTeq bioceramic inserts will make up for the oxygen deficit. They emit negatively charged ions of oxygen with the concentration of 800—1000 ions/cm3, quite comparable to the quality of fresh countryside air. Magnetotherapy has gained special popularity through many years and is currently considered to be one of the most efficient methods of physiotherapy. It promotes acceleration of the treatment process, reduces arterial tension, improves functioning of the vegetative, nervous and endocrine systems, restores the immunity and obviously doesn’t invoke any side-effects. MagTeq magnetic inserts will continue to strengthen your health day by day. PentActiv health-improving bracelet with magnetic inserts is a drug-free treatment method and a preventive remedy, based on the action of magnetic field in the areas of biologically active spots on wrists. This chemical element was discovered in the end of the 19th century, however its therapeutic properties were yet to be discovered. Numerous researches have indicated that germanium possesses a wide spectrum of healing actions. It contributes to the transfer of oxygen in tissues, elevates the immune status and possesses antitumoral effect. GermaTeq inserts act as follows: tactile contact with germanium activates complex biochemical processes in the body, which further promotes overall invigoration of the blood circulatory system, saturation of blood cells with oxygen, and hence—their rejuvenation. As our body radiates long IR-rays, it needs constant replenishment by long-wave heat. If such recharge is impossible, the body rapidly gets weak, grows old, it further provokes different illnesses against the background of general body deterioration. Perfect InventionPentActiv bracelet has bioceramic inserts that emit far IR-rays. IR-rays from SolarTeq bioceramic inserts penetrate into the skin and contact with water molecules. This promotes dilation of blood vessels, and further improves the blood flow to various organs and tissues of the body. Today many manufacturers of wellness products create various therapeutic bracelets, however only Vision Company can boast of a bracelet with a unique combination of healing inserts, able to influence all functions of the body. PentActiv bracelet is an effective and safe way to improve health. Another difference of PentActiv from its analogues is that it is not only a health-improving bracelet, but also a beautiful, elegant and exquisite accessory—PentActiv bracelets are covered with 23-carat gold. This is the link Online Shop where you can order products on your own. You just need to put my consultant code (which is ECV-4085456 ), register as a client, search for the Bracelet product under Accessories and place the order! Enjoy your bracelet! with Vision. Make sure to tag me on Instagram once you have received it!